Have you recently bought the new iPad from Apple? The new iPad has a new voice dictation feature which will be a big help to all bloggers out there. How so? If you’re a blogger, you’d know the whole process of thinking of ideas to write about and when you do, you have to take note of that right away. You have to list each idea down because you might just forget t in a few minutes. Not to mention, you have to type everything on your blog site or word processing software. Yes, the process can be tedious but thanks to this new iPad feature, it can help make every blogger’s life a tad bit easier. Imagine how you would normally talk to a friend or share a story. Everything is free flowing and you don’t even have to write anything down. You are free from any writer’s block as you just keep sharing away your thoughts and opinions. Isn’t that easier than going through the whole process of writing? 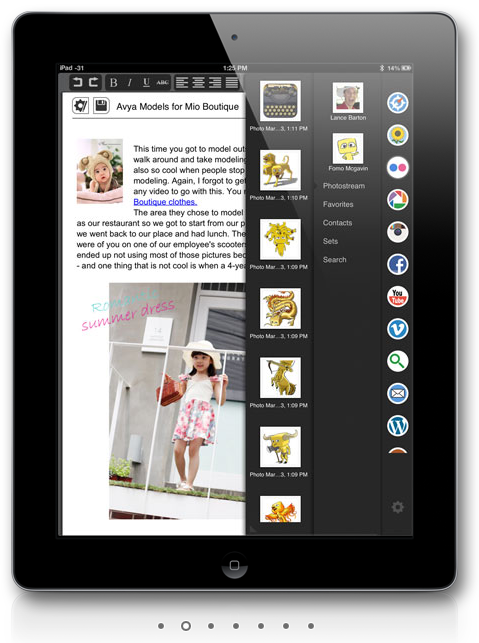 Indeed it is and that’s what Blogsy, the voice dictation feature of iPad is offering you. It doesn’t really matter what you’re writing about, cars, cosmetics, health, pets, news or whatever. You can use Blogsy (a very cute name) to input your spoken words into text in a snap of a finger. Blogging has never been this easy and you can thank Apple for that. However, this ultimate tool for bloggers may not be too easy to use if you’re a beginner. But luckily, I’m going to share with you some tips on how you can use Blogsy conveniently and properly. Assuming you already have a blog site or account, you have to set up Blogsy to that account. If you don’t, you can always sign up for free blog sites like WordPress or Blogspot. To start the set up, simply open Blogsy on your iPad and then click the gear icon, which you can see on your lower right. The gear icon is Blogsy’s Settings. Here, you can find several options like General Settings, FAQs etc. Look for Service Settings and then choose among the given options the blogging platform you are using. After that, input your account details and Log In. Once the log in is complete, go back to your main Blogsy screen and start blogging! Observe the Blogsy interface closely, you’ll notice that majority of the screen comprises of text boxes broken into the Title and Body. You will also see text editing tools on the top of the screen while on the right side, you will see the media tools. To start blogging, you have to input the Title first. Of course, you’ll do this by speaking. Once you click on the input box, the keyword will pop up and the microphone will be at the left side of the space bar (also the activate/deactivate button). Are you ready to speak? Touch the button and speak after you hear the chime. Once you’re done, tap the same button again. Wait for at least two seconds for the text to appear on the Title box. Do note that your iPad’s microphone is actually located on top of your device so make sure you speak close to it and enunciate your words clearly when speaking. As for writing the Body, the procedure is the same. No blog is complete without photos and videos, hence, this will be the last work you’ll do. You can simply add media files in Blogsy through dragging and dropping images/videos into your body. You can source your media from Google Images, YouTube or your own photo files. There’s no stopping technology today. Back when we thought that using a blogging service was cool enough, Blogsy has up the standard several notches higher. Lucia Harks spends her days building websites and web toys. She’s always interested to collaborate and learn about upcoming and existing industry trends. She aims to help empower every woman on technology by sharing tech, security, startup, web design, lifehacks, and other related news.